Tofino has a magnetic appeal for nature lovers from all over the world. Nestled into rocky outcrops and sandy coves, Tofino looks out across a tranquil ocean inlet framed by the mountains of Meares Island. The clear waters of Clayoquot Sound reflect jagged, glacier-capped mountains and lush rainforests descending to the sea. It is no wonder this area has become a pilgrimage for adventure tourism and a haven for those seeking a beautiful seaside retreat. There is always a boat leaving for Meares Island Big Tree Trail, Hot Springs Cove or a nature cruise. Seafood is on the menu of award-winning gourmet restaurants. Galleries display a wealth of art from a large local population of artists and First Nations carvers. In summer, visit a lively Saturday Market. 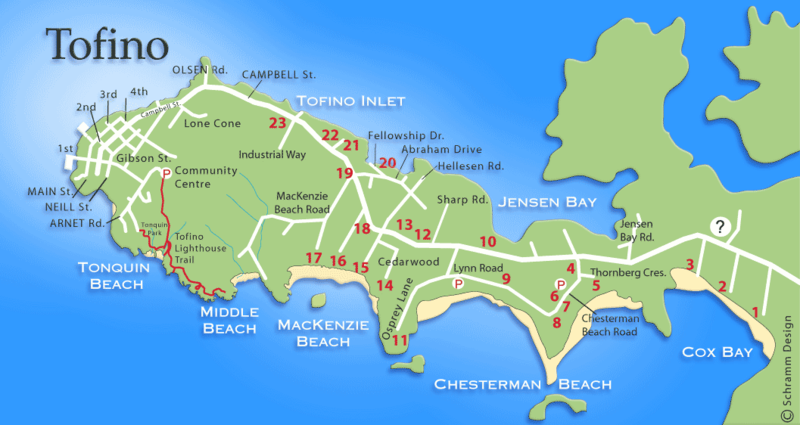 Tofino has grown from a sleepy hang out to a trendsetting community offering a unique escape. Sunset photos from this trail are well worth the walk! 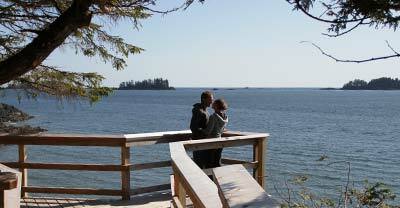 Views of Tonquin Beach are especially scenic and the overlook deck offers wrap-around views. The forest also has photogenic treasures and artistic benches. Tonquin Trail is an easy ‘out and back’ gravel trail, which meanders through old-growth forest, from the Tofino Community Hall, to Tonquin Beach and Third Beach. The path is approximately 2.6 kilometers round trip, with beautiful views of Clayoquot Sound. It identifies historical and cultural heritage, respects the local ecosystem, and reflects the spirit of the community. It makes a lovely family outing for visitors and residents. Stay on the trail. Rocks may appear safe but waves can suddenly appear. Keep dogs on a leash. No camping allowed. Rustic hand split bordwalk and huge trees are photogenic. Deep shade under large trees can be a challenge, cloudy days are easier to achieve good lighting. This ancient and culturally important island is accessible via boat, canoe or kayak. The trail head is difficult to see so it is advised to book your trip with a whale watching company, kayak outfitter or take a guided First Nations canoe tour. You can experience a short cruise or paddle and an old-growth forest in just over an hour. Meares Island is famous as the site of protests to protect virgin forests in Clayoquot Sound. The Island is now a Tribal Park. A small fee is collected for maintenance. The hand split boardwalk is very rough and the dock has difficult footing not advised for the elderly. At higher tides the access is a scramble up a short but steep bank.